I was going looking for some Christmas decorations in the streets, but surprisingly perhaps they aren't there .... yet. In desperation I wandered through a large shopping centre, and not surprisingly found boughs of holly and coloured glitter balls everywhere. Thankfully the endless Christmas Carols and White Christmas dreaming music have not yet infected the speakers, so the scene would not have been complete and I was saved from photographing it! 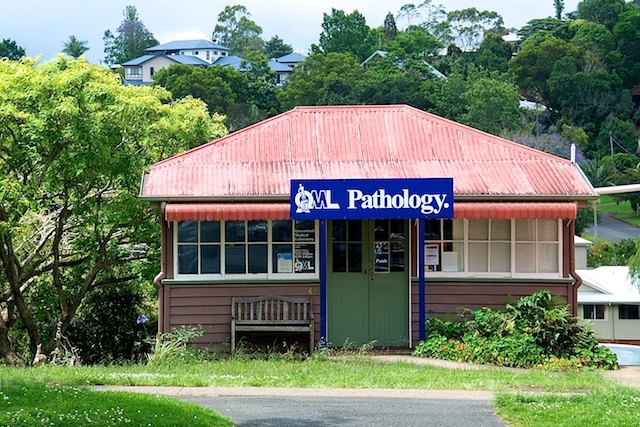 In the end, it was the pathology clinic in Maleny that caught my eye, right there in the main street. It didn't take too long to work out what the former cottage was now being used for.